Wraps are healthy. Wraps are cheap. Wraps are versatile. So how it is that a post on wraps has yet to be done? 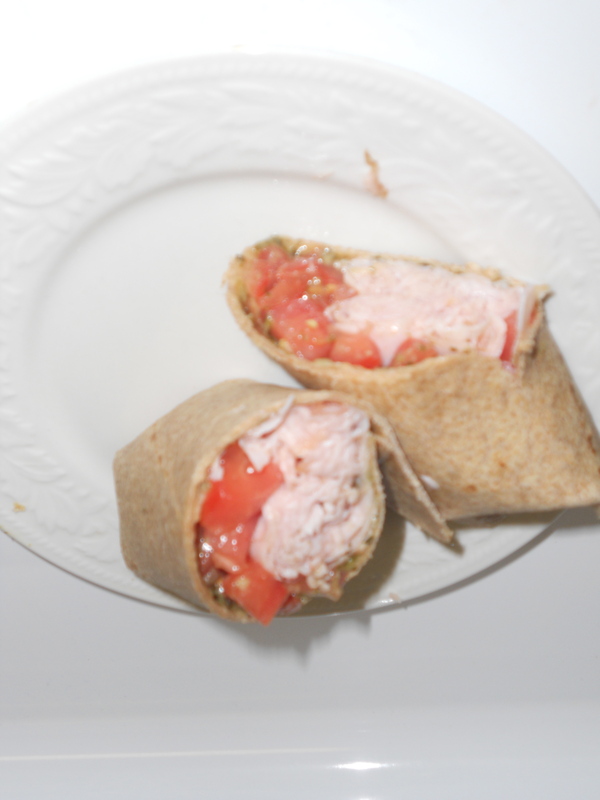 In particular, a post about wheat wraps lined with basil pesto and topped with sliced turkey and roma tomatoes? This is one of the easiest meals, made in record time (4:30 thank you very much), and there’s few ingredients involved. Chances are you already have them in your fridge. If not, grab em’ next time your’re at the store, since this is one of those no-planning processes. It’ll work for lunch or dinner. Tortilla Wraps. Wheat is healthier than regular plain ones, but feel free to go either route, or mix it up with a different flavor like tomato basil or honey wheat. Medium or small sizes work best. Basil pesto. I usually keep a small container in the fridge and use it on multiple occasions (with pasta or sandwiches). You’ll need about two spoonfuls for this recipe. Feeling daring? Make your own pesto using my recipe. Fresh sliced turkey breast from you local deli. Smoked or honey works best for this particular wrap. 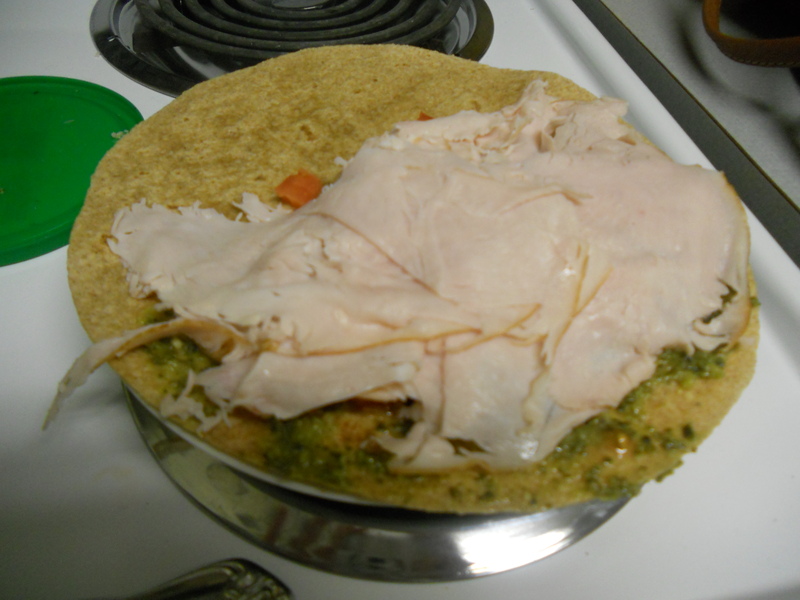 You’ll need about five or six slices, unless you want your wrap on the thick side, in which case throw in a few more slices. One roma tomato (the oval-shaped ones), since they’re a touch healthier. A regular ones (only use half) will do just fine as well. 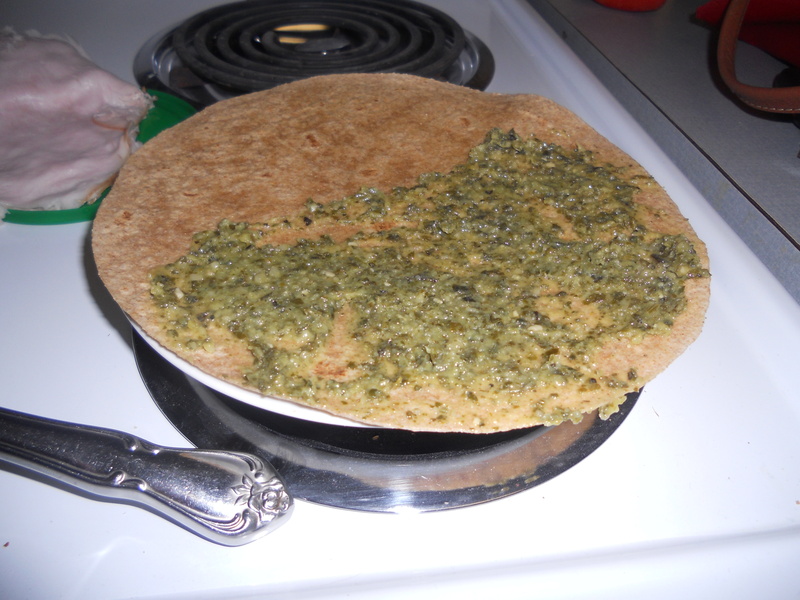 Cover about three-quarters of the wrap, laid out flat, with the pesto (about two spoonfuls), spreading it evenly. Be generous here, that pesto flavor completes the wrap. 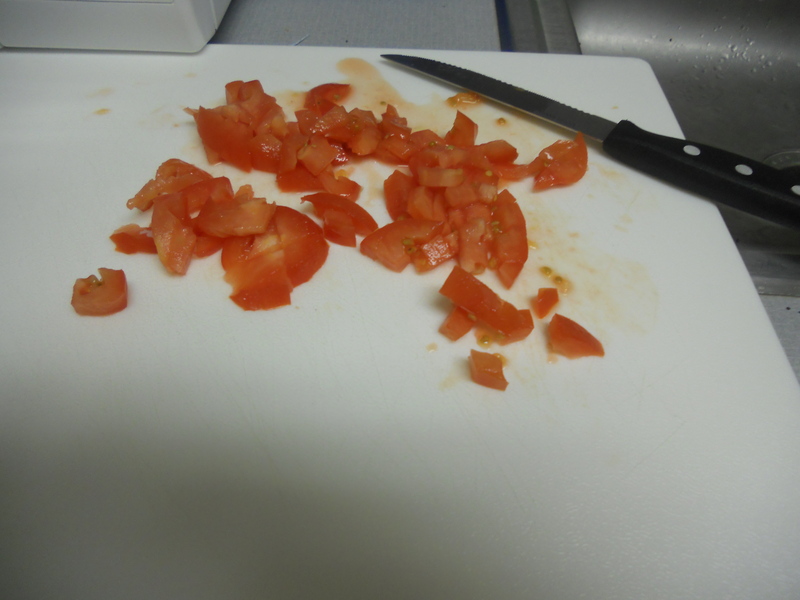 Dice up the tomato into small cubes. 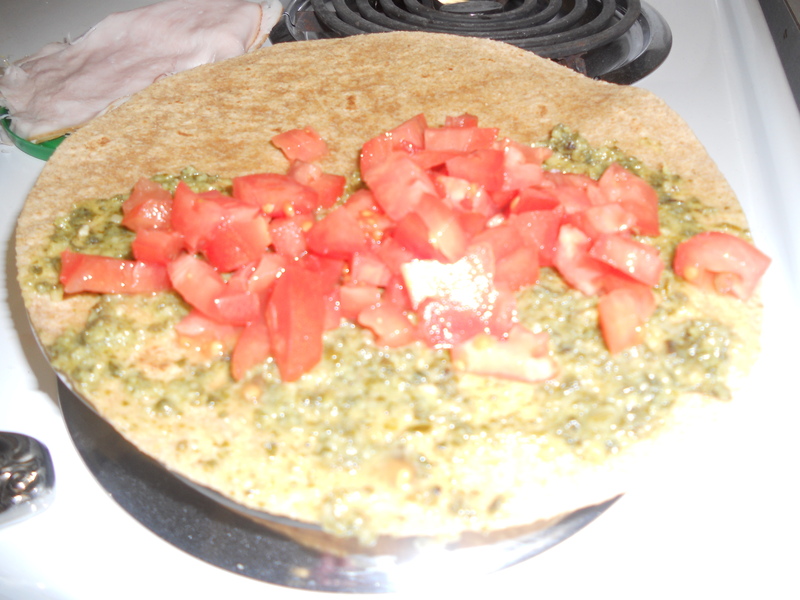 Then layer the tomatoes on top of the pesto. Sprinkle some back pepper over it all then get ready for the tricky part, wrapping it up. 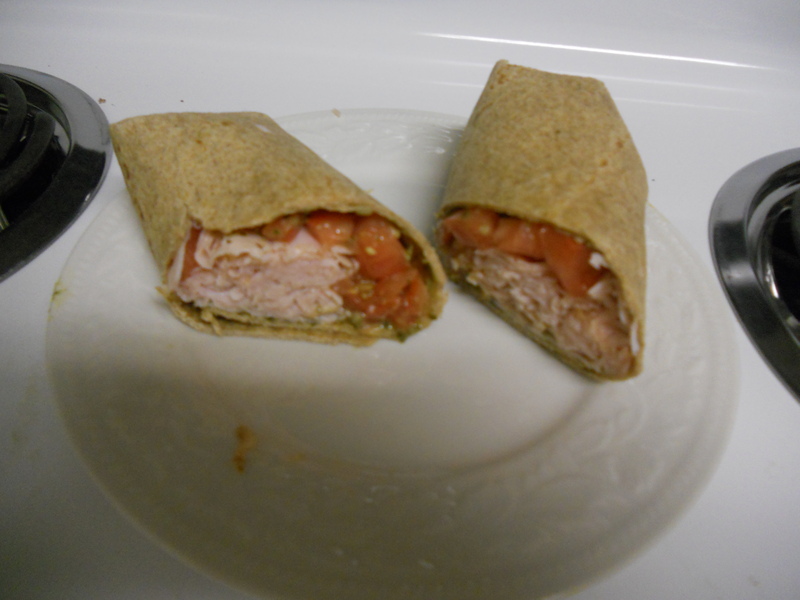 If you’re like me, and not too concerned with the wrap staying together since you;re about to devour it anyway, then you can just fold it up as you would a fajita or soft taco, making sure one end overlaps the other. If you’re on the fancier side and maybe serving this to guests or want to save it for later, you should fold two opposing sides inward, then wrap it up, making sure all the stuffing stays in the middle. If you have some handy, stick a toothpick on two sides of the wrap and cut it in half. The ultimate pesto-lover in me prefers this wrap, but there are a ton of different options you could try. Grilled chicken would work great here, or instead of pesto, use spicy brown mustard, your favorite salad dressing or hummus. Almost anything will substitute, so get creative! Throw in some lettuce for an extra crunch, or add some mozzarella cheese for a delicious (yet a bit unhealthier) touch. Check out the Food Network’s Food Network’s wrap collection for more great ideas. 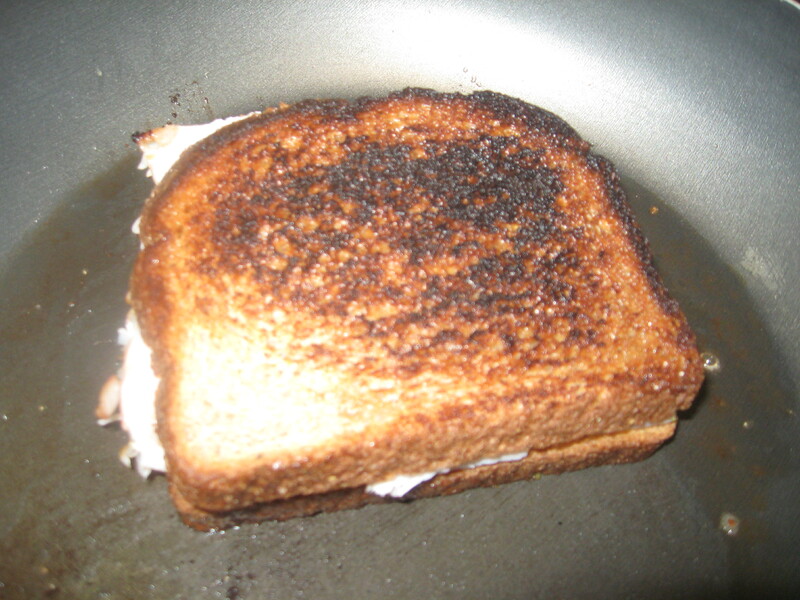 Apparently April is National Grilled Cheese Month… who knew? Grilled cheese is undoubtedly a college staple being its quick and easy self. But, unfortunately it’s not the healthiest of meals, and most people don’t bother thinking about how fattening the toasted gooey goodness really is. 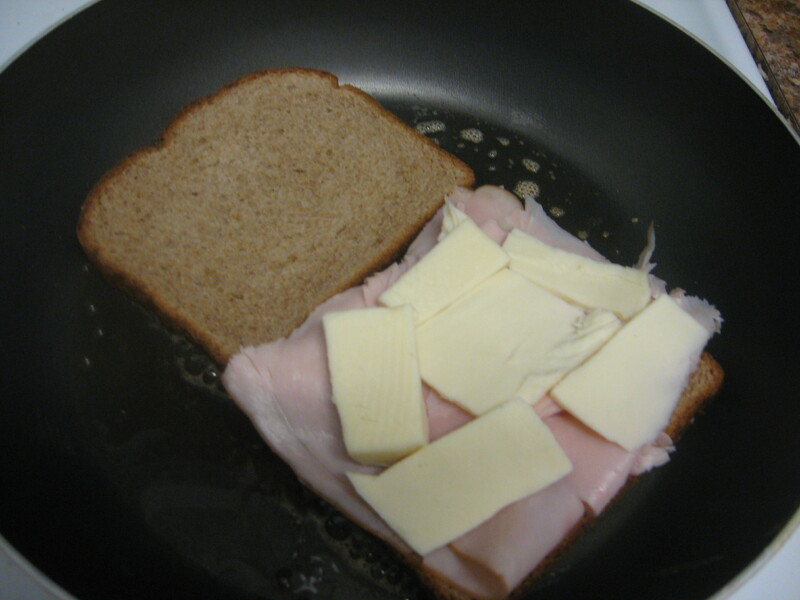 One way to lighten up a grilled cheese is to use low-fat cheese (swiss or provolone are good options) rather than pre-sliced and packaged singles. An even better way to make a healthy version is to stuff the sandwich with ingredients that are good for you and will keep you full for longer. Instead of layering cheese slice after slice, opt for vegetables, or something with substance like chicken or deli meat (you’ll get your protein for the day too!). Instead of using the traditional butter in your pan, try using a non-stick spray or even a little bit of olive oil to cook the sandwich. I made a grilled cheese for lunch yesterday that was loaded with sliced turkey breast and mozzarella cheese, topped with tomato slices and avocado slices. To flavor it up I spread brown mustard and a dab of honey and sprinkled black pepper. 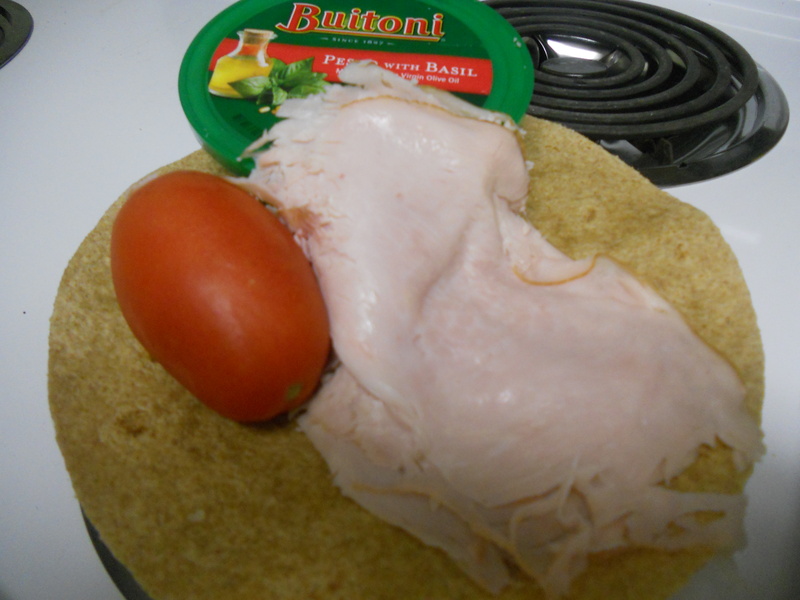 It was a delicious combo and kept me full all day- a much healthier alternative to the traditional bread and cheese combo. Spray the pan or coat lightly with olive oil and bring to low-medium heat. Slice the tomato and avocado and get everything else out and ready. 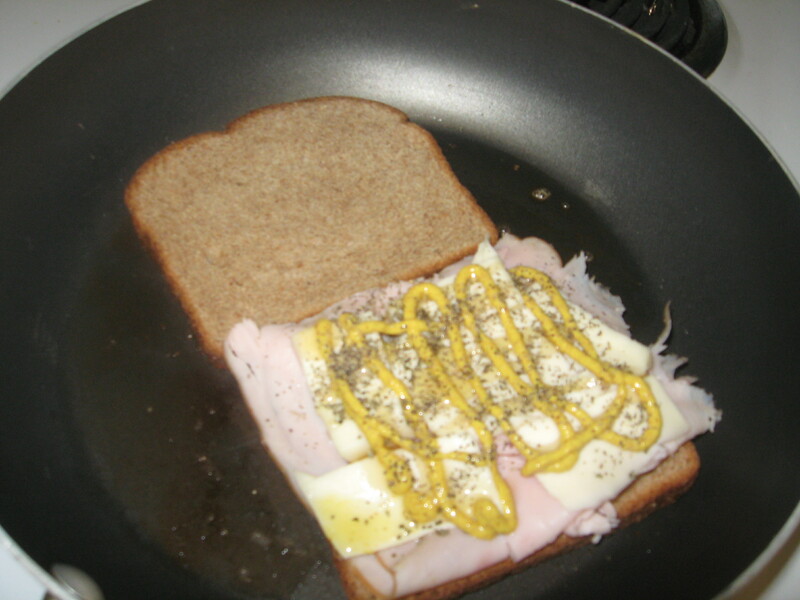 Place the turkey and cheese on one slice of bread and top with the honey, mustard and pepper, and then place this slice (bread down) and the other slice on the pan. You’ll have to stay by the pan and watch it: they’ll heat up fast. 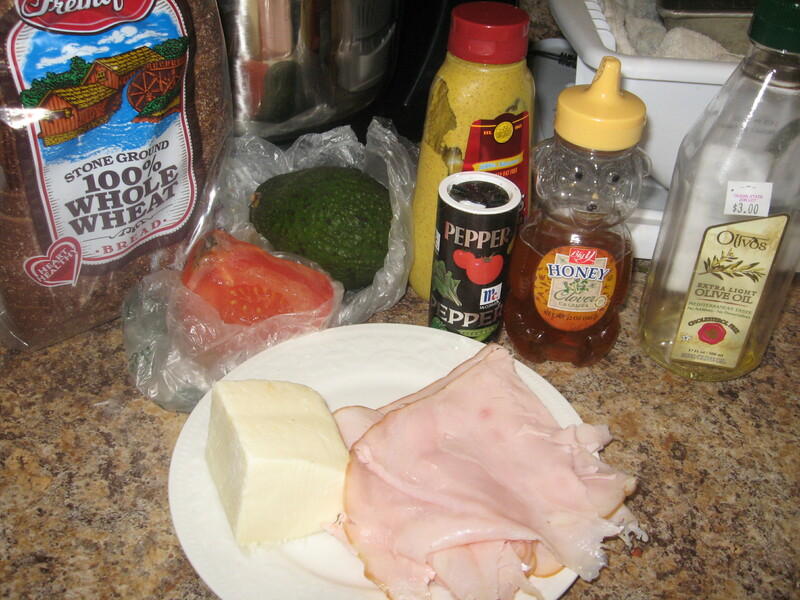 Let this cook for a minute then add the tomato and avocado to the slice with the turkey and cheese, and place the other slice of bread on top of this slice, completing the sandwich. 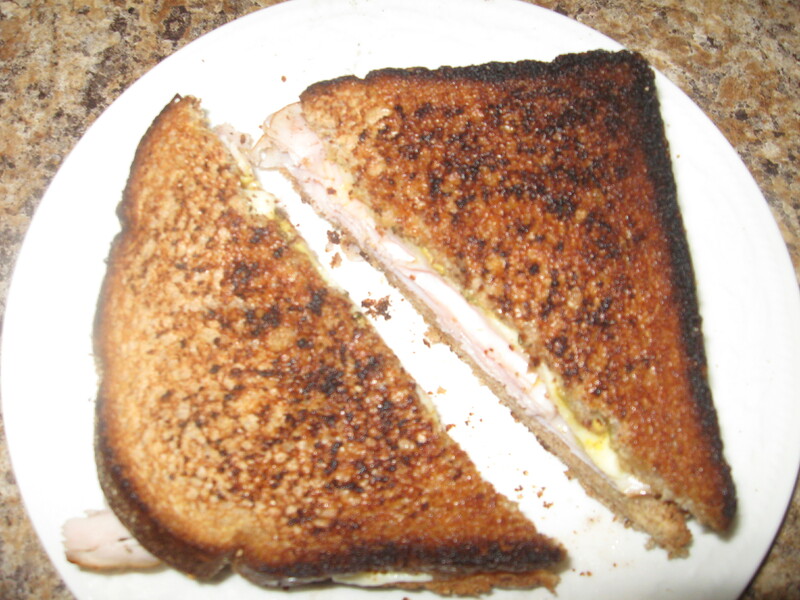 Flip the sandwich once to make sure both sides and browned, and take it off the heat when it’s golden brown, or if you like it a little bit on the crisper side (like my picture), wait a second longer… read: I screwed up. Don’t wait too long, it really tastes 10 times better golden brown and not burned. Let it cool, cut it in half, and enjoy!